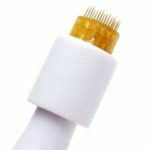 Derma Roller or Derma Stamp for Hair Loss? Microneedling is a beauty treatment that involves creating hundreds of tiny punctures in the skin. It sounds painful, but this activates the body’s healing response, potentially improving scars, stretch marks, wrinkles – and even reversing hair loss. 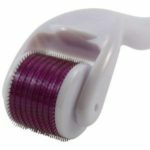 There are two tools for microneedling: derma roller and derma pen. In this post we’ll look at whether they work for hair loss as well as which tool is best. When you receive an injury, your body activates its wound healing response to repair the damage. This process, hemostasis-inflammation-proliferation-tissue remodeling, involves the release of growth factors that cause new tissue to grow. Microneedling aims to harness these healing and remodeling capabilities for cosmetic reasons. The idea is that the treated area heals better than it was before. Wrinkles are replaced with new, younger-looking skin. Scars disappear as damaged and dead cells are cleared away during the healing process. And new hair cells are created on bald scalps. At least that’s the theory. Microneedling gained attention as a potential hair loss treatment with the publication of this study from 2013. You can read about the 2013 derma roller trial in more detail here. 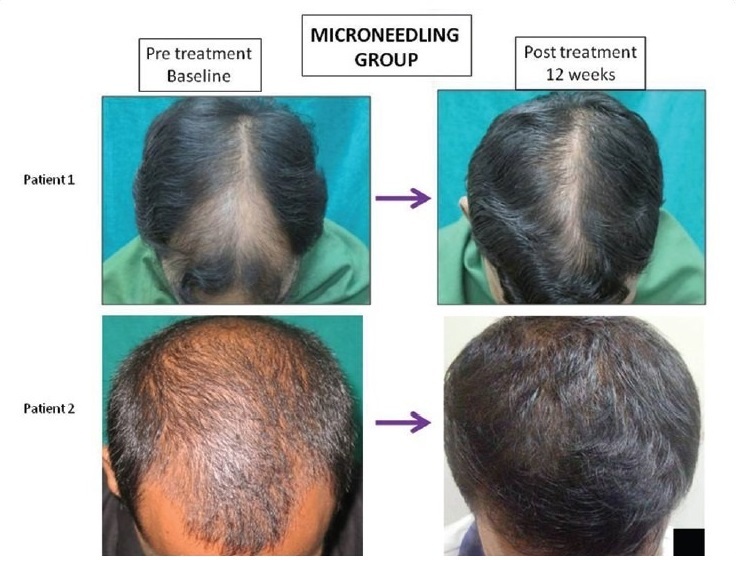 The 2013 trial was one of the first experiments that looked at the effects of microneedling on androgenetic alopecia. It provides strong evidence that microneedling can be used to reverse hair loss. But it also raises some questions. Participants who were treated with a 1.5mm derma roller once per week saw more hair regrowth than the minoxidil only group. But perhaps even better results could be achieved by microneedling once every other week – or by using a derma roller with different length needles. It would be good to see a follow-up study which looks at what the optimal microneedling routine for hair regrowth is. There are two types of microneedling tools available: a derma roller and a derma stamp. A derma stamp, in contrast, has a flat surface so microneedling is done by pressing it into the desired area. At the time of writing, there are no trials that have specifically looked at using a derma stamp for hair loss. But the idea is the same with both: mild injury to the scalp activates a healing response that also repairs hair follicles. So, in theory, you could achieve the same effect as the 2013 study by using a 1.5mm derma stamp instead of a roller. Both derma rollers and derma stamps are available with a range of different sized needles. But there are advantages and disadvantages for each tool. If you have long hair, for example, you may find it gets caught in a derma roller and so prefer to use a stamp instead. However, using a derma stamp may take longer as a roller is able to cover a large area more quickly. As for results, they’re unlikely to differ much between the two. If the same area is covered using the same length needles, a derma roller and a derma stamp should produce similar results. The wound healing response is something that comes up regularly in the treatment of pattern hair loss. Copper peptides often crop up in online forums as an effective hair loss treatment due to the fact that they encourage this response. In mice, plucking hair encourages the regeneration of surrounding follicles. Also, many of the same growth factors and responses that make PRP effective are triggered by microneedling. Somehow, the body’s natural wound healing response is able to encourage hair to regrow in previously bald areas. And microneedling appears to be one of the most effective ways to activate this wound healing response. The 2013 study showed just how effective microneedling can be, but research is limited. Without trials of different sized needles and different treatment intervals it’s difficult to say with certainty what the best microneedling routine for hair loss is. In theory, though, there is no reason to expect different results from a derma pen compared to a derma roller. Previous post: When Will Hair Loss be Cured?